Image caption The Tote is a long-standing symbol of British horse racing. Betfred has confirmed that it is among a number of betting operators looking to take over government-owned bookmaker, the Tote. 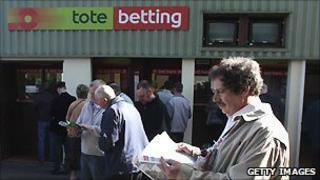 Friday was the final day for bidders to make an offer for the bookie, with any sale possibly netting up to £250m. Efforts over the past three years to sell off the Tote hit problems, and the government faces getting a lower price than the £400m mooted in 2007. The Jockey Club opposes the sale and wants the Tote to remain independent. Betfred's finance director Barry Nightingale said the firm wanted to provide long-term support to the horse racing industry and "would be a natural partner for the Tote". Other potential buyers could include Paddy Power, Gala Coral, Sportech, South African Tote, and France's PMU. The sale is being opposed by The Jockey Club, which wants the Tote to remain independent. The Tote, founded in 1928, is a long-standing symbol of British horse racing. It has 517 High Street betting shops and the monopoly to run pool betting online and at 60 racecourses in the UK. Financial adviser Lazard is handling the bidding process on behalf of the government. It would not say how many expressions of interest had been put forward for the Tote. The chief executive of the Association of British Bookmakers, Patrick Nixon, thinks the sale will "get away" this time, because of the wide selection of interest and proposals he understands have already come forward. "The government's objective here is to divest itself of an organisation - the Tote - which it regulates," he said. "So, that's one reason why it wants to proceed that way. And, it also wants to raise money to tackle the deficit, on a much broader basis of course. "So, its commitment is to sell it in such a way that it secures value for the taxpayer, while recognising the support it provides to racing." In the year to April, the Tote made profits of £13.3m on revenues of £2.8bn, and contributed £11.3m to the horse racing industry. The country's biggest two bookmakers, William Hill and Ladbrokes, have been ruled out of bidding for the Tote on competition grounds.